Pakistan’s military uses India as justification for its nuclear arsenal. But nuclear weapons are of little real use. With the Conference on Disarmament (CD) scheduled to start its first session of 2012 in Geneva from January 24, the Islamabad-based Institute of Policy Studies held a seminar on “Challenges to Pakistan’s Nuclear Program and Fissile Material Cut-off Treaty.” The participants, as has been highlighted by reports in the Pakistan Observer and the Nation, supported the position that the country has taken on blocking any progress on the FMCT negotiations. It may be recalled that Pakistan has held this position over the last few years, demanding that the treaty must include existing stockpiles of fissile material within its scope. The rest of the states armed with nuclear weapons, in contrast to the Pakistani position, conceive the FMCT as a prospective treaty that’s meant to prohibit the future production of fissile material from the time it enters into force. Therefore, in their formulation, it isn’t meant to have a retrospective effect. Why is Pakistan maintaining such a position on the FMCT? Judging comments by the Pakistani ambassador to CD, Zamir Akram, it’s because Pakistan feels threatened by the asymmetry that exists in the fissile material stockpiles of India and Pakistan. This, he fears, provides an undue advantage to India and would allow it to build a larger number of nuclear warheads. Second, he believes the problem has been compounded for his country by the grant of the waiver to India by the Nuclear Suppliers Group that has opened the opportunity for India to acquire uranium from abroad, thereby enabling the country to use its own uranium reserves for the strategic build up. A visibly disadvantaged Pakistan, therefore, is left with no option but to obstruct the FMCT. Both these issues raised by Pakistan are worthy of a closer examination from the point of view of the contrasting nuclear doctrines of the two countries. Pakistan perceives its nuclear weapons as the essential foil against a possible threat from a conventionally more capable Indian military. Its threat perceptions are completely India-centric, and while India has never expressed designs on Pakistan, these perceived threats don’t seem to go away, largely because the Pakistan Army needs to maintain a threat in order to retain its position in the national power polity. India, in this scheme of things, becomes a useful tool for the military. Another related question is why would India find it necessary to bring its conventional might to bear against Pakistan? After all, New Delhi has repeatedly identified “lifting its masses from poverty” as its foremost priority. Why, then, would it want to deviate from this goal to wage a draining war against Pakistan? Obviously, Pakistan knows the answer to this lies in its own policy of using terrorism as a foreign policy tool. This is now a proven fact after the revelations made by David Coleman Headley. Well aware of the fact that India’s threshold of tolerance to Pakistan fomented terrorism could well be breached at some point, Pakistan finds it prudent to project a low nuclear threshold to deter an Indian conventional response. In order to maintain credible nuclear deterrence, Pakistan therefore feels the need to build a large and variegated nuclear arsenal. This is perfectly logical in the game of nuclear deterrence. But the one important factor that tends to go missing in this calculation is the uselessness of the nuclear weapon for actual military use. 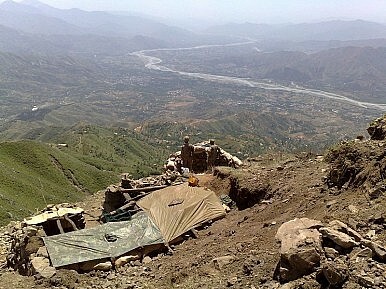 While it can serve as a powerful political weapon, and Pakistan has used it effectively for many things ranging from deterring India to acquiring huge sums of military assistance from the United States, if Pakistan is actually serious about militarily using the weapon in any contingency, it will be dismayed to discover how little it would contribute to national security. In fact, operations research conducted by organizations like the Rand Corporation has clearly established that the military use of the nuclear weapon can never redeem the situation for a smaller and weaker conventional state. At the same time, it’s equally true that the political use of the nuclear weapon doesn’t require a large nuclear arsenal. In fact, nuclear parity or superiority is immaterial. All that Pakistan requires to deter India is a nuclear capability that’s just enough to cause damage that New Delhi can never brook as acceptable. By the same logic, India doesn’t need more than would be necessary to cause unacceptable damage to Pakistan. Therefore, more than the asymmetry in fissile material stockpiles, it’s the asymmetry in nuclear doctrines or the understanding of the actual use potential of the weapon that keeps Pakistan from participating in the FMCT negotiations. India’s nuclear doctrine is based on deterrence by punishment – the message conveyed in the threat that any first use of the nuclear weapon would result in retaliatory damage that will be far in excess of any gain that the adversary hopes to make. Such a formulation of deterrence doesn’t require too big an arsenal – it only has to be enough to cause “unacceptable” damage, and for rational actors, this state can’t be too far on the damage threshold. For irrational actors, deterrence can’t work anyway. In case Pakistan can rationally assess the requirement for its nuclear deterrence, it will find it unnecessary to keep the option of building fissile material stockpiles beyond a finite limit. Rather, an unnecessarily large stockpile of fissile material and warheads would add to security requirements and concomitant concerns. Therefore, without actually compromising its nuclear capability in any way, it’s perfectly plausible for Pakistan to participate constructively in the CD. And, in the process, earn some international goodwill too. Maintaining a nuclear arsenal is expensive. Emphasizing this could be one way of discouraging some nations.